Survivor: China (2007) - 7th place, 10th out - 4th juror. Voteed out in Episode 10, "Ready to Bite the Apple" (Day 30). Survivor: Micronesia-Fans vs. Favorites (2008) - 7th place, 12th out - 4th juror. Medically removed in Episode 12, "I'm Gonna Fix Her!" (Day 31). 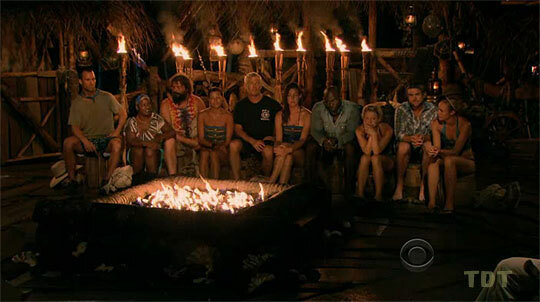 Survivor: Heroes vs. Villains (2010) - 14th place, 7th out. Voted out in Episode 6, "Banana Etiquette" (Day 15). China Ep. 1 IC: "Dragon Dance" - Carries a pole, opens the gates, and Fei Long wins. China Ep. 2 RC: "Chinese Checkers" - Scores Fei Long's winning point; Fei Long wins again. China Ep. 3 RC: "Clear the Deck" - Fei Long men win both their heats, but Fei Long loses, 3-2. China Ep. 3 IC: "Blade Runner" - Can't make up for Courtney's slow start, Fei Long loses again. China Ep. 4 RC: "Great Balls of Fire" - Places winning fireball with Jean-Robert, Fei Long wins again. China Ep. 4 IC: "Warrior's Duel" - Scores two points, Fei Long wins again, 4-3. China Ep. 5 IC: "Plunge, Pull & Pop" - Now with Zhan Hu, who throw the challenge (and lose). China Ep. 6 RC: "Search and Decode" - Gathers planks, but Zhan Hu loses again. China Ep. 6 IC: "Name That Spoon" (gross food) - Eventually finishes his balut, scoring a point; Zhan Hu wins. China Ep. 8 RC: "Bucket Stops Here" - Part of the winning team, with Todd, Amanda, and Jean-Robert. China Ep. 9 RC: "Drum Roll" - Part of the losing team, with Todd, Peih-Gee, and Denise. China Ep. 8 IC: "Dragon Rider" - Third person to drop out, at circa 20 minutes (7th/9). China Ep. 9 IC: "Take A Stab At It"- One of four to sit out and eat, instead of compete (tie-8th/8). China Ep. 10 RC: "Confucius Said" - Gets 4/5 questions right, but doesn't win (tie-2nd/7). China Ep. 10 IC: "Star Struck" - Hits two threes in the first round, but no points in the second (tie-3rd/7). Micronesia Ep.2 RC/IC: "Smash and Grab" - Works the keys for Malakal, and Malakal wins. Micronesia Ep.3 RC: "Beach Bash" - Drags people around, Malakal wins. 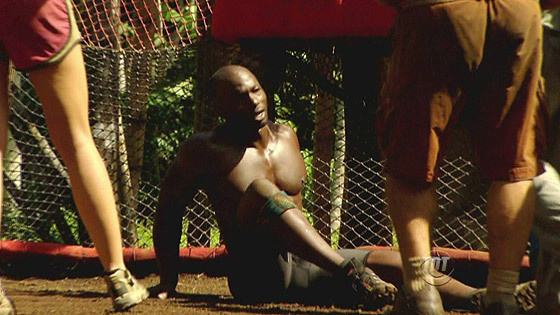 Micronesia Ep.3 IC: "Nut Bucket" - Holds the ropes for the Malakal basket, but Malakal loses. 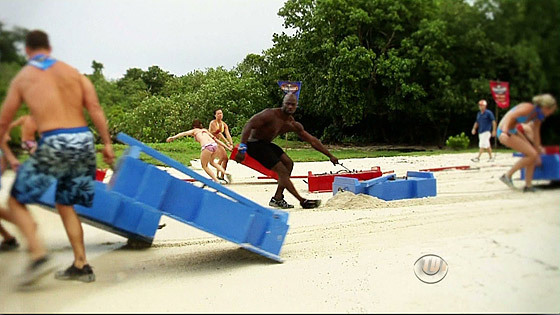 Micronesia Ep.4 RC: "Diver Down" - Comes up with the puzzle solution, and Malakal wins (thanks, Ozzy). Micronesia Ep.5 RC: "Cat and Mouse" - Now with New Airai, and Airai wins. Micronesia Ep.5 IC: "A Stone's Throw" - Airai wins again. Micronesia Ep.6 RC: "Build It Up, Break It Down" - Airai wins again. Micronesia Ep.6 IC: "United We Stand" - Airai wins again. Micronesia Ep.7 RC: "Money Roll" - Finally, Airai loses one. Micronesia Ep.7 IC: "What-Er Drag" - Airai goes right back to winning. Micronesia Ep.8 RC/IC: "The Gauntlet" - Airai saves one last win for the end. 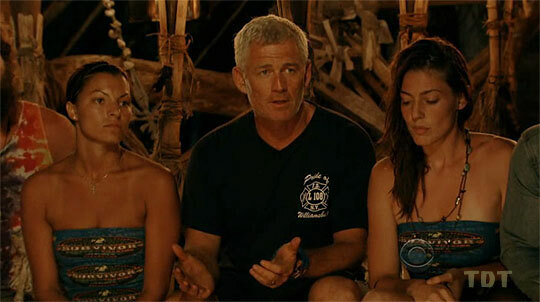 Micronesia Ep.10 RC: "Bai Bai" - Part of the losing team. Micronesia Ep. 9 IC: "Last Gasp" - Eighth person to drop out, after an hour (3rd/10). Micronesia Ep. 10 IC: "When It Rains, It Pours" - Fifth person to drop out, just under an hour (5th/9). Micronesia Ep. 11 IC: "Pool Party" - Makes it to final round, but loses to Erik (2nd/8). Micronesia Ep. 12 RC: "Body Slam" - Thrid person eliminated (5th/7). Heroes vs. Villains Ep. 1 RC: "Battle Dig" - With Rupert, scores winning point vs. Tyson & Rob; Heroes win. Heroes vs. Villains Ep. 1 IC: "Lock and Load, Light" - Part of the Heroes' paddling team, but Heroes lose. Heroes vs. Villains Ep. 3 RC/IC: "Sumo'an Mud" - Easily beats Randy, Heroes win luxury items, coffee. Heroes vs. Villains Ep. 4 RC: "Slip, Slide & Score" - Scores a point vs. Sandra, but the Heroes lose. Heroes vs. Villains Ep. 4 IC: "Roll With It" - Blindfolded ball roller, but the Heroes lose again. Heroes vs. Villains Ep. 5 RC: "Schmergen Brawl" - Injures his knee early on, and the Heroes lose. Heroes vs. Villains Ep. 5 IC: "Blind Cube Crisis" - Caller for the Heroes, Heroes lose on the puzzle. Heroes vs. Villains Ep. 6 RC: "Rope-A-Dope" - Tied with Colby for last place in the immunity portion (tie-5th/6). China, Ep. 6: Receives the Fei Long idol (and instructions on finding its Zhan Hu twin) from Todd (Day 17). China, Ep. 7: Finds the Zhan Hu idol, giving him two total - one found, one held (Day 19). China, Ep. 10: Voted out while holding both idols, neither of which he played. China, Ep. 5: One vote, from Aaron. China, Ep. 8: Three votes, from Peih-Gee, Erik, and Jean-Robert. China, Ep. 5: Five votes, from Todd, Courtney, Amanda, Denise, and Erik (voted out, 5-1-1). Micronesia, Ep. 11: Three votes, from Natalie, Alexis, and Jason. Micronesia, Ep. 14: Voted for Amanda Kimmel, who finished second (5-3). Heroes vs. Villains, Ep. 5: Two votes, from Colby and Tom. Heroes vs. Villains, Ep. 6: Five votes, from Colby, Rupert, Candice, Amanda, and J.T. (voted out, 5-1). No, they shouldn't be resting! Why would you say that? How did we lose that? They need to focus! Just got an idol from Todd! Just don't eat the damn apple! Final four preview, guys! Whoo! Why would I go from 5 to 2? CBS pre-game interview: "I'm in the burial business. I bury people. If need be, the bad boy will come out!" Probst pre-game assessment from TV Guide online (8/20/07): "He is without question the biggest guy we've had on this show. He's actually a gentle giant, a very decent guy who works extremely hard. But if you rile him up, he'll let you know what he's thinking." Christopher Rocchio at RealityTVWorld (11/9/07): "James Clement talks muscles and romance"
Christopher Rocchio at RealityTVWorld (5/2/08): "James Clement talks about Survivor: Micronesia"
Eric Goldman at IGN.com (5/7/08): "Survivor: Micronesia Interview: James"
Rhoda Charles at TVGuide.com (5/7/08): "Survivor Castoffs James and Alexis Recount Their Downfall"
Dalton Ross at EW.com (2/3/10): "Which woman is going to stab James in the back this time?" Andy Dehnart at RealityBlurred (2/9/10): "James Clement: 'I've got to focus and do the whole social, networking, talking thing'"
Dalton Ross at EW.com (3/26/10): "James reveals how long it took him to get drunk after being voted off"
Gordon Holmes at XfinityTV.com (3/26/10): "Castaway Interview: James Clement"
Kate Stanhope at TVGuide.com (3/26/10): "James: Colby 'Didn't Want to Be There'"
Daniel Fienberg at HitFix.com (3/27/10): "James Clement talks Survivor: Heroes vs. Villains"
"James Clement owns a burial service and works as a gravedigger. In addition, he works security at nightclubs and weddings and bartends on the side. His hobbies include watching television and surfing the Web. He enjoys sprinting, weight-lifting and playing football. Clement describes himself as athletically gifted, socially adaptive and physically attractive. He is proudest of carrying on the family business. He feels he'll do well because he considers himself to be physically and mentally adept, adventurous and able to adapt to new environments and situations. Clement currently resides in Lafayette, Louisiana, with his pit bull, Brently. His birth date is March 9, 1977." Why Did He Come Back? : “To prove to myself I can get further in the game.”"